Let's Talk About Water Movement in an SPS Tank. OK, with the success of the two other threads, the lighting thread and water quality thread. Lots of people wanted to talk about water movement. IMO, there are many way to go about creating good water movement in an SPS tank. Many products and methods can be used: Closed loops, power heads, Tunze Streams, wavemakers and spraybars to name a few. The key, IMO, is not to have any dead spots in the tank. Something that becomes progressively more difficult as the tank matures and Acroporids grow into the flow cutting off water flow to areas (and corals) behind them. I wanted to attach some mov files to show what I mean by current in the tank. All the polyps on the coral should be moving. I think that better water flow allows the polyps to be swirled around rather than all blowing in one direction. With a slight pause once in a while if you have varied current (a good thing). I once read someone explain it by stating the polyps should look like a small bush does if you give it a good shake once in a while. The first movie shows a coral in my tank near the bottom middle. It gets good flow from both two sea swirls and a Tunze stream. You can see the polyps being to tossed about a good bit in this one. While looking at this you can see the flow is not as intense as the rest of the coral but it still gets a few good blasts of water every few seconds. That last movie I wanted to show you, as I think one of the biggest problems we have to face is lack of flow in the tank as the corals grow and the tank gets older. Many people start noticing a lot of recession on the base of their Acroporids after a few years. The tank is packed with coral (many large staghorns) and most likely the culprit is poor circulation. OK those are my opening thoughts. Hopefully the movies are able to help you to see what the polyps should look like when getting good flow. So let's discuss what works for you, or hasn't, or what questions you might have. So basically it's not how much flow, but where the flow is and where it is going, correct???? Good thread. Water flow is the last obstacle I need to takle on my reef. I think we should each start our replies by listing our current circulation methods. I'm currently running one seio and 3 MJ1200's along with about a 600 gph return (from basement). All powerheads are pointing at another PH. Flow is good and varied through much of the tank but I can't get rid of dead spots. I've gone over and over strategies and can't think of any that won't cost a fortune. I can tell what a difference flow makes when I move corals around and see the reactions. Policipora seems to be the most affected in my tank with recession around the base. I guess because their so dense. I'm leaning toward replacing my 3 MJ's with a tunze 6080. I would then have the tunze on one side pointing at the seio on the other. I'm worried about getting whirlpool flow since the tunze will overpower the seio. I will probably end up with two tunze's since seio's don't have enough force to cover 6' of tank. so how do you guys mount your tunze's? On each end pointing at each other? Is a controller necessary or just nice. My MJ's are creating shade in the middle and I want them out. Water flow shouldn't only be addressed by pumps and and other current generators. 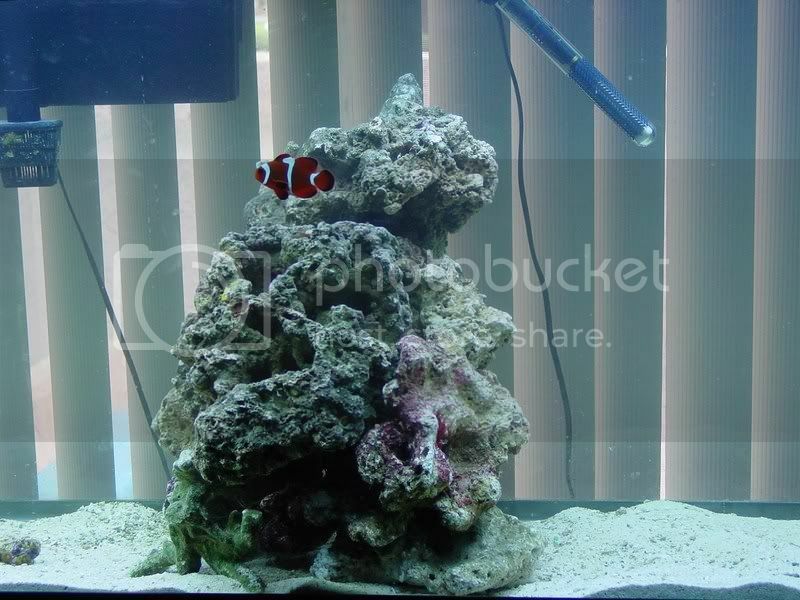 Two other big factors is live rock aquascaping and stocking densities. Poor rock placement has a huge impact on flow. This is obvious and advised by most reef books. But stocking density is the other big issue. It really doesn't matter how many Tunze streams you have if you try to crowd too many sps-corals together. They will quickly block each other off from incoming current. That is why some more experienced sps keepers get a little critical of densely stocked tanks full of frags and colonies. After having my share of RTN episodes and crashes, I've learned less is more. I think it's much easier to regulate flow in a tank with fewer but much larger colonies, than a tank with many colonies that are smaller and crowded. 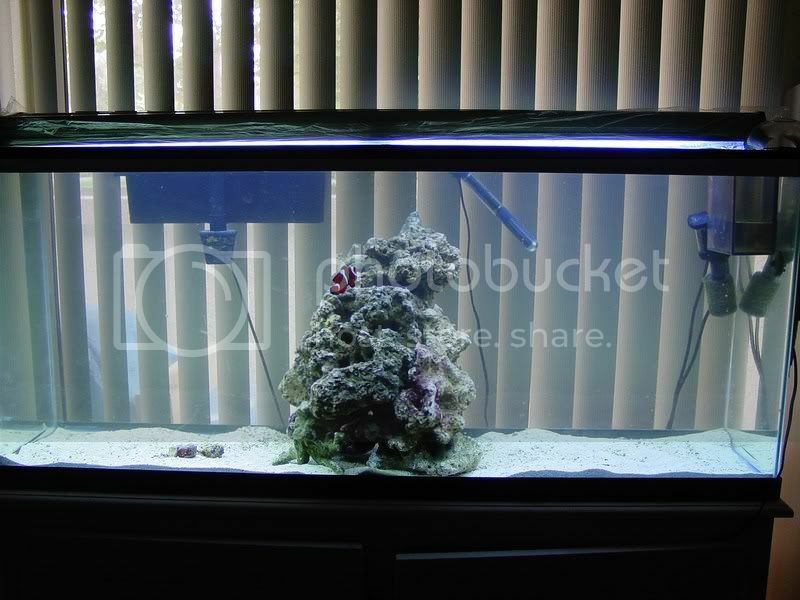 Take JB's tank for example: as his coral have grown, he's removed some colonies to make room for the growth of other colonies(reading from other posts). I'm willing to bet that the remaining corals grew faster after the removal, by opening the coral up to more flow and light. What is your opinion on the use of surge tanks for water movement? I have a question about flow based on experience from diving. Cozumel has one of the best reefs in the world. The SPS is extremely thick and beautiful. The curent at Cozumel is nothing like what is described in the first post. It is a constant on directional current at a couple knots. It is like being in a constant strong wind. The dives are all drift dives and you can't swim against the current. I guess my question is if I mimic the current affect in Cozumel why won' the SPS do well, or as well as the mixed changing current described above? Is this a case where we can improve on or pick the optimimum conditions in nature? Does anyone run a one directional current like in nature? With regards to Cozumel, my guess would be that those reefs are a very different sort of environment than the niche we commonly try to mimic. I remember mostly massive stonies at Cozumel that form huge mounds or globes (like a closed brain coral) mixed with many gorgonian and other life. I think the pacific sps corals we keep desire conditions more similar to the A. palmata (elkhorn) and A. cervicornis (staghorn) corals in the Carribean that grow best in the turbulent breakers or other areas with variable flow. Not sure if that is correct but it would be my guess. Why a Tunze then as it comes from one direction with the possibility of some obstacles. Wouldnt we all be better off with something like the ocaensmotions that can be set up coming from many different directions and intermitent if one chooses? Flow was the most difficult part of setting up my reef tank. I spent a good amount of time engineering a system to prevent dead spots. But even with a close going to a 4-way OM unit and MJ 1200. I still have a few small dead spots..
schanz, I only have one stream in my tank. I mounted it on the side pointing down the long end of the tank near the front. It's really the only place I could fit it. Water flow shouldn't only be addressed by pumps and and other current generators. Two other big factors is live rock aquascaping and stocking densities. Poor rock placement has a huge impact on flow. This is obvious and advised by most reef books. But stocking density is the other big issue. It really doesn't matter how many Tunze streams you have if you try to crowd too many sps-corals together. They will quickly block each other off from incoming current. Yup. I think it's one the biggest reasons people start to see problems in their tank after a few years. Keeping up with the changes in flow is tough. Even harder when you have lots of corals in tight areas. I think they work pretty well. I've seen a few tanks with them. Personally I don't like them because of the size of the plumbing and extra tanks needed to get a surge as well as the bubbles and noise. But they work well, and some people really like them. It's another way of getting good water movement. rstark33, There is so much current in a real reef. I don't think our small tanks can come close to the amount of flow in the wild. I think in our tanks we try to get as much as possible but there is really no way to get the kind of flow and turnover that a real reef has. Bomber, I agree with you, eductors are superb at getting tons of flow in the tank. I can't use them as I have a DSB in my tank and it would kick up way too much sand. prafferty, I think the oceanmotions are a great idea. But you need to plumb the whole thing up so it can be hard to put into an existing setup. But for new setups, I think they are very promising. Streams do move a ton of water though, more than I think you could realistically get out of an ocean motions unit. But each tank has needs that one or both of the product can help with, IMO. I am planning my 58g's flow. I think I've decided to run a Calfo manifold return that will allow me to redirect return flow in the future to take into account SPS growth. I will likely use a Wave2K center unit (the belt problem is fixed now) to create back and forth surge motion. If I feel I need more flow, I may add a single Stream on the floor or an over-the-back closed loop. One thing I am doing with this project is factoring in LR placement and its impact on water movement. I will be using Tonga rock for its porosity and ability to limit how much touches the floor. I will also be using less than I've done in the past. Of course, I'm going starboard bottom to maximize flow and cleanliness. May try that faux sand approach. "Patience" is what most of us lack. SPS = "Stability Promotes Success"
I am currently running 4 MJ1200's on a Red Sea Wavemaster Pro. It seemed like a whole lot of current initially but now that my tank has been maturing I can tell that the flow has been reduced. There is also another problem, as my corals are growing they are starting to go into the direct streams of the MJ's which totally rips off all flesh from the skeleton. I can see this a huge problem in the near future. How are you guys that run MJ's solving this while still keeping your flow up? All of my MJ's are near the top of my tank also. "It is better to have and not need then to need and not have." If you cut the nozzles off on the MJ, the flow will be more distributed and less like a pressure washer. It's a common modification, just do a search on RC. HTH. Great thread. When talking about water flow, I think it is very important to differentiate between flow vs. velocity. For example, many think that just because the velocity is high, that they are getting a lot of flow (gph). This is a common misunderstanding that I have seen quite a bit. OK NEWBIE QUESTION. im still in the process of settingup my 55g i still havnt decided when i return the water from the sump. scwd or a spray bar. here's a pic of the setup now. I've found that when using high volume pumps (closed loops, Streams), a great way to manage a lot of flow is to bank it off the glass. You lose some of the direct velocity, but it creates very random currents - you can get behind and under rocks in ways not possible with outputs blazing right over the rockwork. Of course this can play havoc with sandbeds, but... I don't have that issue. so still scwd, spraybar, or just the return line i'll use off the glass bangs with these but which one will be best. Also wanted to point out my feeling that large staghorn acroporids do more harm than good in a tank. I think they grow too quickly and when large cut off flow to huge sections of the tank. Most of us would be better served with smaller more compact acros I think. How are you guys that run MJ's solving this while still keeping your flow up? Richard - Officially done shipping coral. Don't ask! Last edited by jackson6745; 07/20/2004 at 12:19 PM. Bouncing the stream off of the glass is good for breaking up the stream of water, so that it isn't just one direct blast of water hitting the corals, but it doesn't eliminate the need for some type of alternating current device. The glass will break up the stream of water the same way all day as long as the pump is on. So even though your water may seem choppy from the top of your tank, it's a consistent choppiness. I think that alternating current with some type of wavemaker is still absolutely necessary. There isn't really a way to get too much flow in a reef tank. What's important though is that you don't want direct flow from a pump or powerhead hitting your corals, or it will tear the flesh right off. 1) Sandstorms - sugar-fine sand becomes a real limiting factor in SPS tanks, especially as they mature and grow out. There is only so much flow you can get before you create a permanent sandstorm. This can be especially problematic in tanks with multiple colonies in the lower half of the water column and when you need to increase flow to prevent lower branch recession. 2) Velocity - the nozzle velocity of powerheads and plumbing outlets can also be a llimiting factor. As has been said before, high velocities can literally tear tissue right off a branch. To reduce this, use larger plumbing fittings for the outlets, eductors, and high-flow powerheads such as Streams and Seios.